Today was a clear day, perfect for mountain trekking. 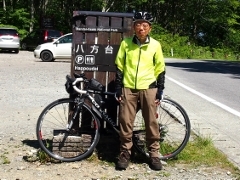 At Mt. 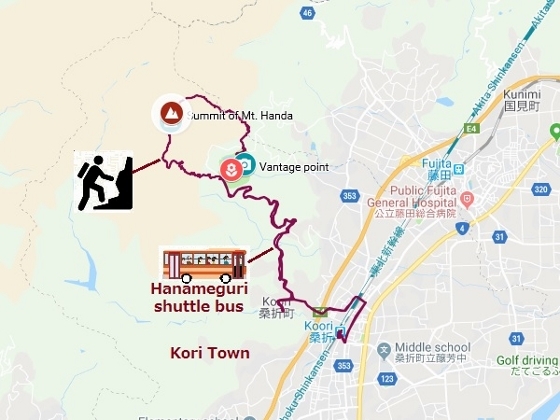 Handa (863m) in Kori Town, seasonal “Hanameguri” shuttle bus service started today between JR Kori Station and trailhead for Mt. Handa (7km). I took the bus to the foot of Mt. 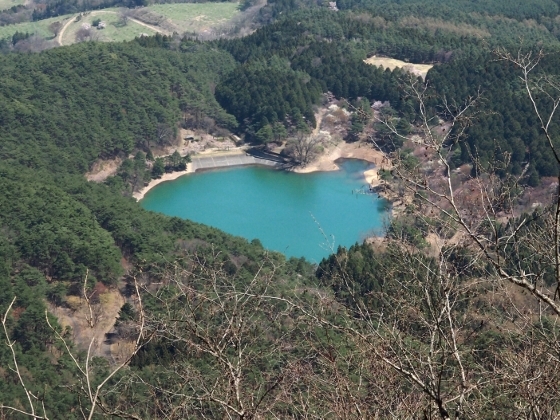 Handa, which was about 430m above sea level, and where Lake Handa or Handa Pond was located. Photo above was a heart view of the pond from near the summit of Mt. Handa. This view has been popular for its romantic shape. 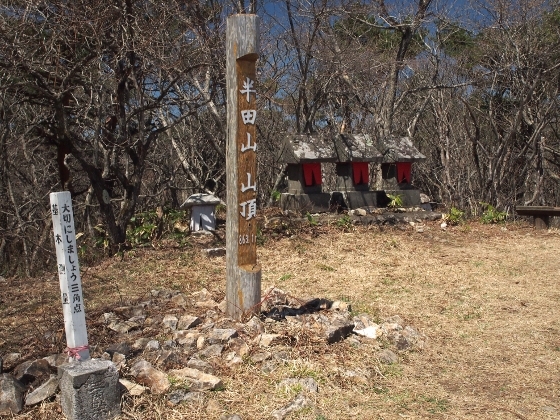 Photo above was a view at the top with a sign post, first order triangulation point at the bottom left, and three small mountain shrines. Mt. Handa was one of three major silver mines in Japan. It started from early Edo period or early 1600’s, and produced silver, gold and other metals. But partly due to a major landslide which occurred during Meiji Period the mine finally closed in 1950. Also, pretty pink flowers, as shown above, were seen here and there along the trail. 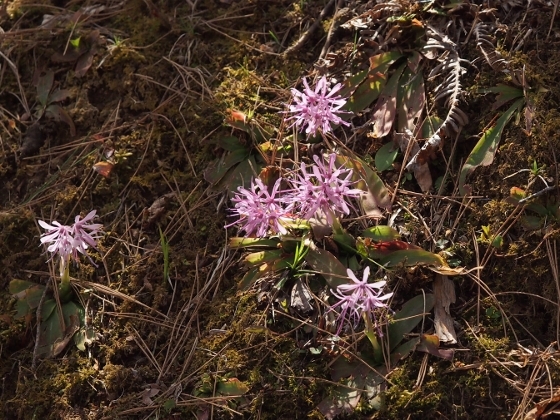 This was Shojobakama or Oriental swamp pink. 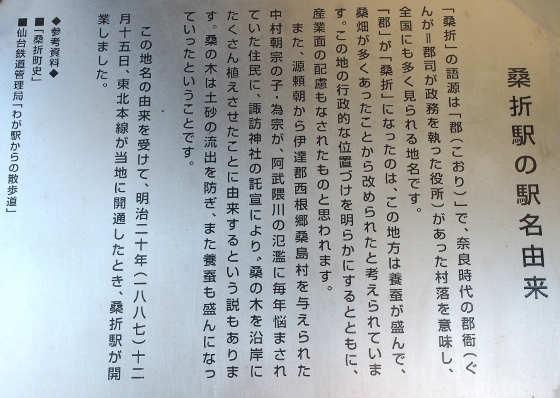 Lastly, in front of JR Kori Station, there was a panel, as shown above, that explained the origin of the name “Kori”. It said as follows. Kori means administrative office in the old days, back to Nara Period some 1300 years ago. So the name meant this area was the center of local administration from old days. But later, different meaning was added to the name and the kanji characters were changed maintaining the same pronunciation, as sericulture or silk production prevailed once in this area. 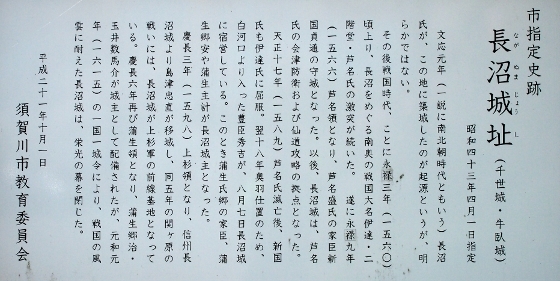 So the station name “Kori” was assigned with the new kanji characters meaning silk production when it opened in 1887. 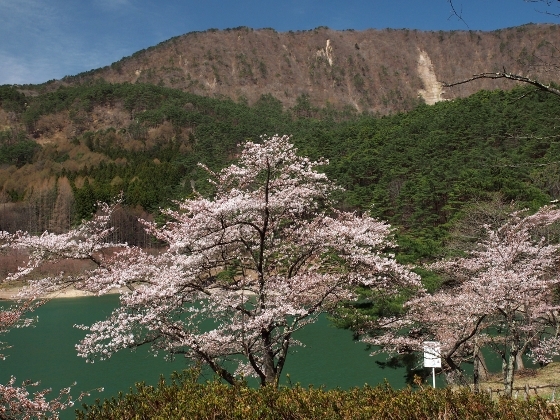 Photo above was a today’s view of Lake Fujinuma decorated by cherry blossoms. 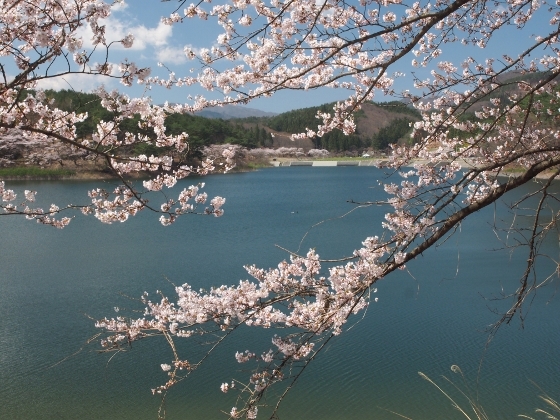 The lake was located in a remote mountain area of Sukagawa City at 400m above sea level. 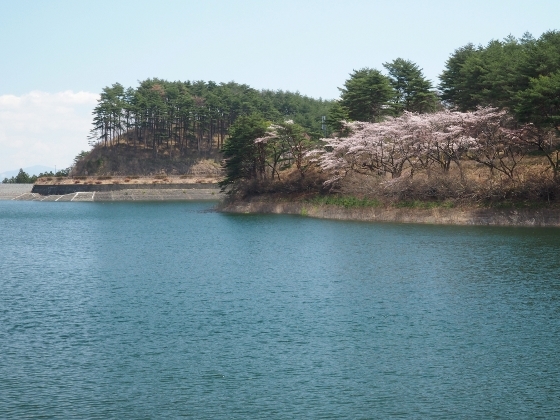 It was a reservoir for irrigation, but was destroyed by the March 11th Earthquake in 2011 and the water caused tragic accident of eight victims. I once visited the lake before in 2015 but there was no water at that time. By this year, the reservoir was restored and the road around the lake and access road were also recovered. The site was again open to the public and tourists. 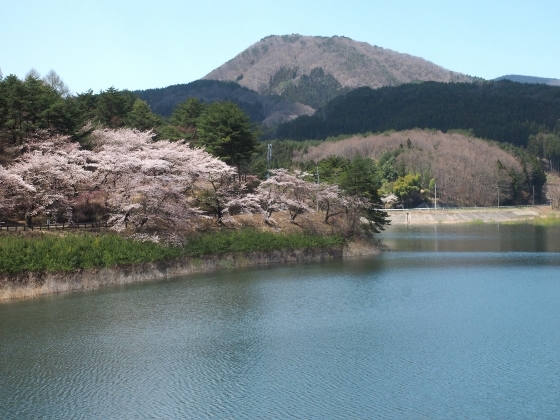 Some other lake views today with cherry blossoms are shown above. On the way to Lake Fujinuma, near the border between Koriyama and Sukagawa, I found a very long line of cherry blossoms as shown above. 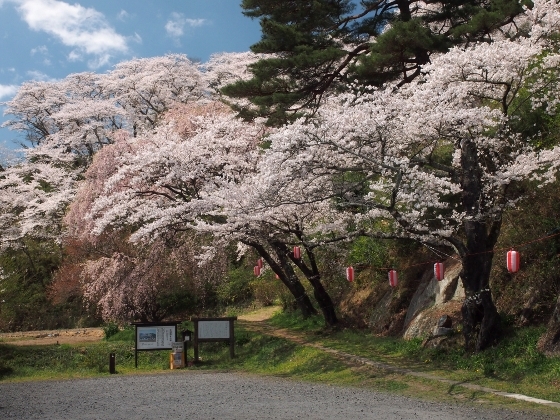 This was actually along the Sasahara River and it was called “thousand cherry trees along the Sasahara River”. On the way back to my home, I stopped at Naganuma Castle site. A description board on site, shown above, explained that the actual castle existed at the site between 1260 and 1615, mostly during medieval times. I just stopped at the entrance of the site today as shown in the picture above. 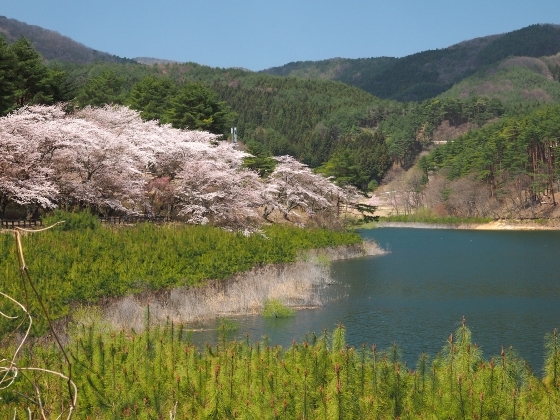 Lake Fujinuma is located in a very remote place on a hill and public transportation is not likely. 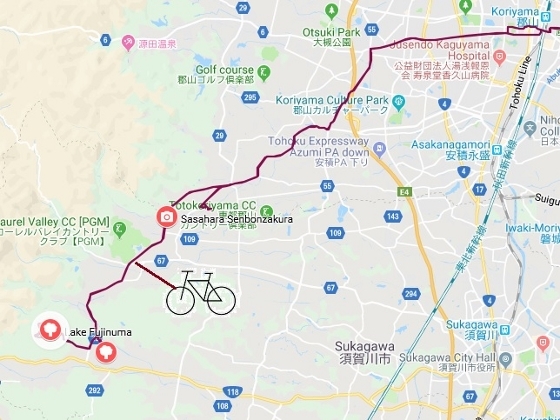 Today I pedaled my bike to the site. Today I visited Kori Town in the north and walked along Kori Peach Line road. 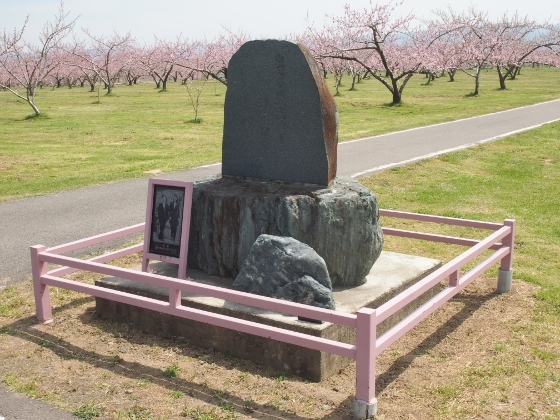 Photo above was a view of peach farm blooming pink with a Kori Town memorial stone. Kori Town has offered its quality peach produce to Imperial Family over the past 20+ years. 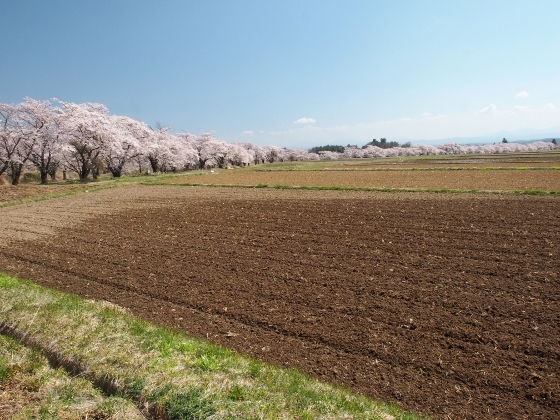 In this time of year, the whole area along Kori Peach Line turns into pinkish field with peach blossoms. 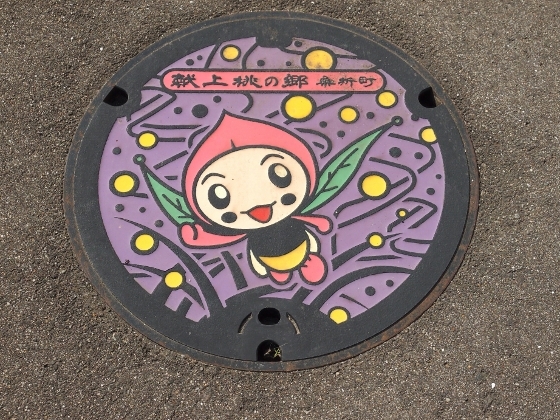 A manhole cover I found on a sidewalk near JR Kori Station, as shown above, also said “Kenjo-momo- no-sato” which meant “home to peaches offered to Imperial Family”. The Emperor and Empress couple visited the farm twice, in 2013 and 2015. Photo shown above was a memorial built by local officials. The Crown Prince and Princess couple also visited the farm in 1996. 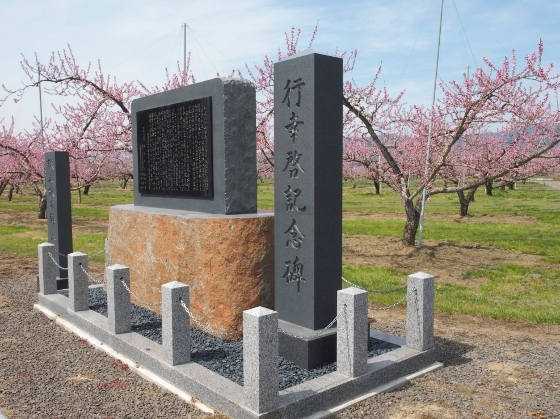 Photo shows the memorial with the background of peach blossoms. 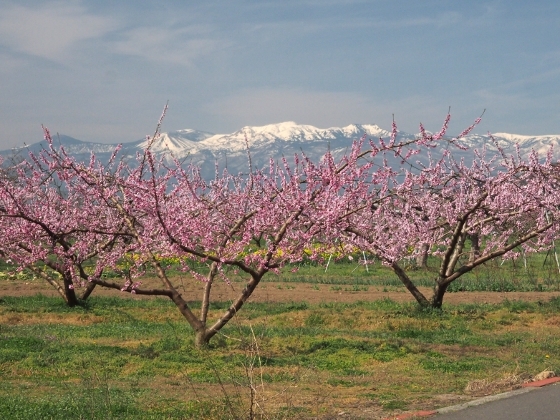 On the way back to JR Kori Station, Azuma Mountains were seen above the peach blossoms as shown above. 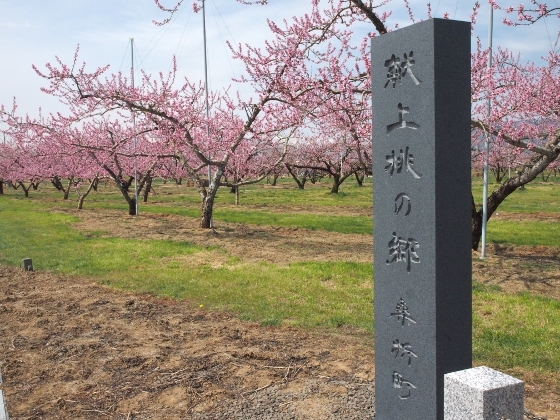 The nearest station to Kori Peach Line road is Kori Station of JR Tohoku Line. 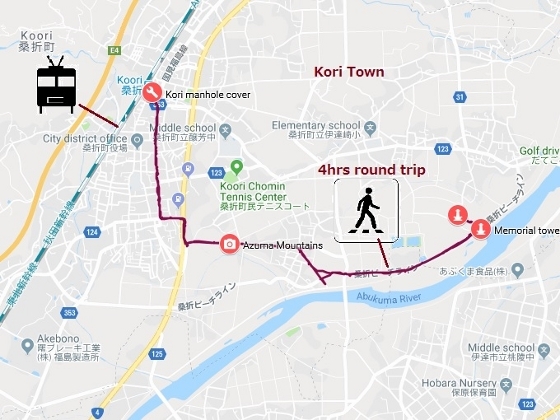 The round trip from and back to the station is about 11km or 4hr walk.